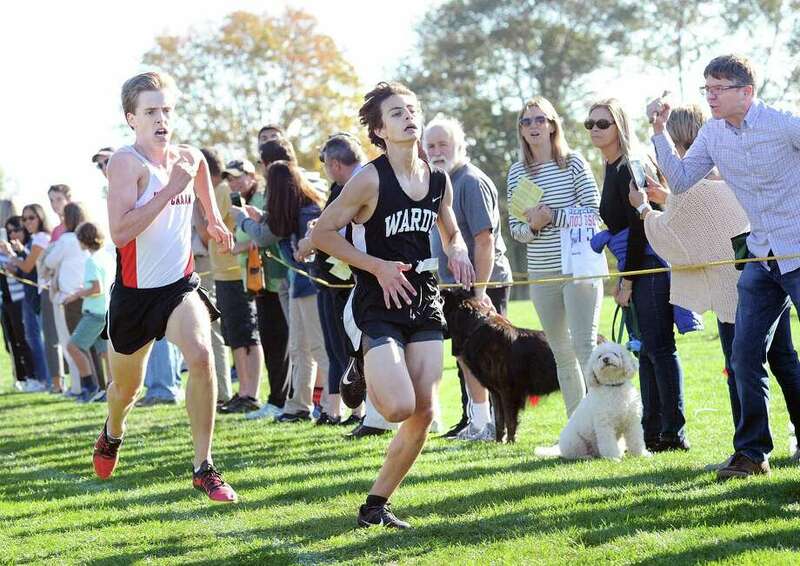 Warde’s Noah Igram is expected to be a key factor for the Mustangs as they begin the 2018 cross country season. FAIRFIELD - How do you replace three senior leaders that brought your squad to third place finishes in both the Class LL and State Open tournaments last fall? Fairfield Warde head coach Tim Foster knows that. Last season, Foster relied on Alex Mocarski (12th place finish, State Open), James Maniscalco (13th place) and Danny Jagoe (28th place) to lead the Mustangs both as runners and leaders. Well, Foster still has a solid pack of runners heading into the fall campaign, he just needs them to stand up as leaders. Those runners - senior A.J. Hutchens, a first team All-FCIAC selection, who finished 56th (17:18) at the State Open last fall, is back, along with another All-FCIAC first team pick, Noah Igram (124 th State Open, 18:14). Other returnees include, Dylan Pomer (119th State Open, 18:11), Jeremy Garskof, Ryan Muhlenberg, Greg Vogt and Peter Biegel. Unlike the Mustangs boys, the Mustangs girls’ squad relied on underclassmen to post a winning 8-7 regular season record and a ninth-place finish in the Class LL meet. Last fall as sophomores, Abby Hart (21st Class LL, 20:59) and Emily Vogt (39th Class LL, 21:36) led the Mustangs. Both are back as juniors. In addition, senior-to-be Caroline Egervari (41st Class LL, 21:41), senior-to-be Dana Calamari (82nd Class LL, 23:17) and senior-to-be Tara McVeigh (88th Class LL, 23:23) return. For the first time in four seasons, Drew Thompson will not be leading the Jesuit pack toward the finish line. The defending State Open and Class LL champion has graduated, taking four years of championship caliber running with him, but Prep coach Bob Ford Jr., isn’t left without experience. In fact, he probably has one of the better up-and-coming runners in the region in sophomore Azaan Dawson, who placed 18th at the State Open last fall (16:40) as a freshman. Last year, Prep placed fourth at the State Open and fifth in the Class LL meet. Looking to help the Jesuits equal those marks in 2018 will be senior Ed Tristine (75th State Open, 17:29) and Ian Cipollaro. “Both will be strong runners for us,” Ford wrote. Prep went 3-1 last fall in the SCC Quinnipiac Division, 9-1 in the regular season and finished seventh at the New England tournament. “We are looking forward to being competitive once again in a strong SCC and Class LL field.” Ford wrote. New coach Kelly Renna takes over for the departed Christina Caron and hopes to build more of the foundation that took the Falcons girls’ to a sixth place finish and the boys’ to a 15th place finish in the Class LL tournament last fall. On the girls’ side, Maggie Leatherwood, Jamie Fortunato and Annalisa Skinner will be captains. Returnees include, Lauren O’Neil - who finished 31st in the Class LL meet in 21:20 -- Maddy Ruggiero (57th, Class LL, 21:46), Micaela Walsh, Julia Antonicelli and Sophie Lesko. Kedar Chavan, Ethan Lovallo, Griffin Boyle, Josh Schaffer, Quinn Lareau and Evan Gander. “The boys and girls on this team are enthusiastic, hard-working, and eager to grow into stronger runners,” Renna wrote. “This season, I am working hard to bridge our cross country and track programs. We have a lot of strong three-season runners, and we are all looking forward to the gains of a full year of training together moving forward. Last season, the Lancers boys’ team finished 25th in the Class SS tournament. The girls did not compete in the CIAC tournament. Coach Ed Berberich is back for his 12 th season with the Lancers. Patrick Milner and Cameron Connolly will be captains for the boys’ team and Valentina Londono will captain the girls’ squad. Along with Milner, Sean Mitchell and Gabe DaSilva are back for the boys’ team and Michelle Jimenez and Madison Bartram are back for the girls’ team.